PHOENIX – When Tinker Hatfield took on the task of designing The Bowerman, he did so because he wanted the award to be as much of an inspiration to collegiate track & field athletes and the future of the sport as the Heisman Trophy is for collegiate football. It’s safe to say with athletes like Christian Coleman and Raevyn Rogers winning collegiate track & field’s highest honor and their visions for the future, Hatfield’s hope is alive and well. Coleman won The Bowerman after an incredible junior year at the University of Tennessee. He became the first male sprinter to sweep the indoor and outdoor short-sprint titles (indoor 60 and 200, outdoor 100 and 200) since fellow ex-Volunteer Justin Gatlin in 2002 and broke or tied a pair of collegiate records (indoor 60 and outdoor 100). The Atlanta native’s rise was nothing short of meteoric. Coleman went from a one-time NCAA final qualifier in 2015 to NCAA indoor champ and two-time outdoor runner-up in 2016 to the Rio Olympic Games that summer as a member of the Team USA 4×100 relay pool, then his otherworldly final go-round on Rocky Top. Let’s not forget Coleman won silver in the 100 at the 2017 IAAF World Championships. Rogers put together a career very few women – or men – at the collegiate level could match. But since The Bowerman is only for a single year, so we’ll have to focus on her 2017. Nothing stood between Rogers and history during her junior year. The Houston native torched the track indoors and outdoors as she had her hand in three collegiate records that still stand – including the much coveted outdoor 800-meter mark of 1:59.10 she set at the Mt. SAC Relays – and swept the indoor and outdoor 800-meter titles once again. 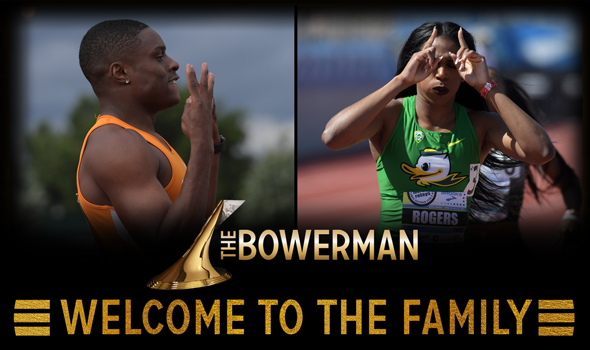 But when it came to winning The Bowerman, Rogers opined on what it meant to her kin. Rogers also gave a nod to those past winners who voted for her during the process.